Product prices and availability are accurate as of 2019-04-22 03:53:22 UTC and are subject to change. Any price and availability information displayed on http://www.amazon.com/ at the time of purchase will apply to the purchase of this product. Smart Cleanup: Scans your Mac's system, iTunes, Mail, iPhoto and Photos applications, garbage bins, and more. System Junk: Removes caches, logs, localizations, and more to trim the excess off your os for better efficiency. 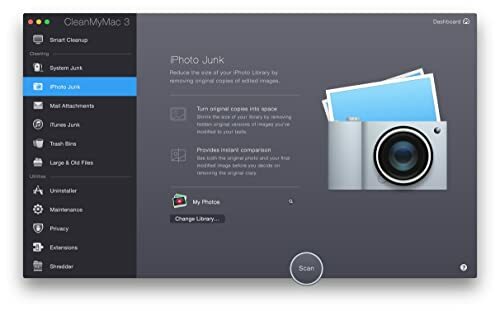 iPhoto Junk: Significantly minimizes the size of iPhoto and Photos libraries by eliminating unneeded copies of formerly edited images. Mail Attachments: Scans Mail for locally saved downloads and attachments, then cleans them out with the click of a button. iTunes Junk: Cleans outdated gadget backups, busted downloads, old iOS software updates, and copies of iOS apps saved locally in iTunes. Garbage Bins: Locates all the garbage bins on your Mac, including external drive trashes, iPhoto garbage, Mail garbage, and other app-specific trashes, then empties them all. Large & Old Files: Brings large and old files to the surface area, arranging them by size, type, and date last opened, and lets you choose and remove the files you do not require. Uninstaller: Completely uninstalls apps, including getting rid of the associated files situated outside the Applications folder. Upkeep: Runs a variety of optimization tasks, including repairing disk permissions, validating your startup disk, restoring the Launch Services database, and reindexing the Spotlight and Mail databases. Personal privacy: Cleans up chat, browsing, and download history, and more to assist keep your activity on your Mac private. Extensions: Lets you manage all your extensions, widgets, and plugins on your Mac. 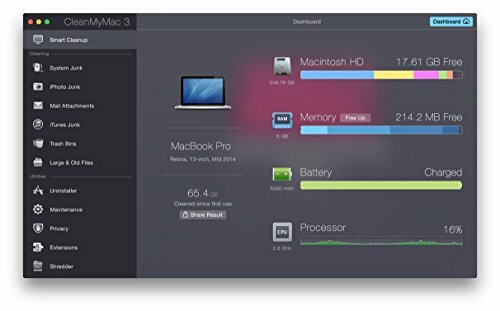 Dashboard: Monitors Mac activity, including RAM use, battery charge cycles, and total health. 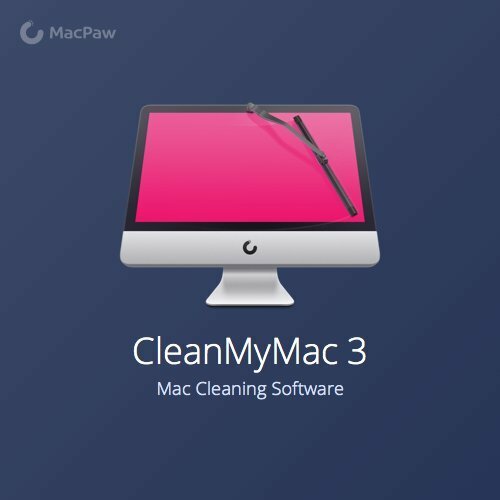 CleanMyMac 3 Menu: Displays the efficiency of your Mac's system, notifies you if there are issues with your Mac's health, and lets you perform numerous CleanMyMac 3 operations without having to introduce the app itself. Smart Cleanup: Scans your Mac's system, iTunes, Mail, iPhoto and Photos applications, trash bins, and more. Privacy: Cleans up chat, browsing, and download history, and more to help keep your activity on your Mac private. Maintenance: Runs a number of optimization tasks, including repairing disk permissions, verifying your startup disk, rebuilding the Launch Services database, and reindexing the Spotlight and Mail databases. Uninstaller: Completely uninstalls apps, including removing the associated files located outside the Applications folder. 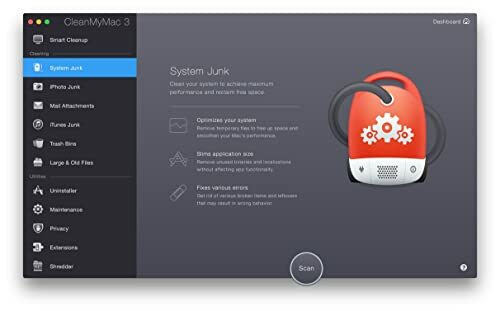 CleanMyMac 3 Menu:Displays the performance of your Mac's system, alerts you if there are issues with your Mac's health, and lets you perform many CleanMyMac 3 operations without needing to launch the app itself.